After a lot of waiting, and them some more waiting, the Benelli Tornado 300 is now on sale. Except that it is now called the Benelli 302R. Has the Tornado dissipated? Okay seriously. The Benelli Tornado 300 was first shown two years ago at 2016 Auto Expo. Since then, the segment has changed. The Kawasaki Ninja 300 has become a very effective motorcycle after a model update and Yamaha, of course, is in the fray with its YZF-R3 - we are now waiting for the BSIV Yamaha to make an entrance. 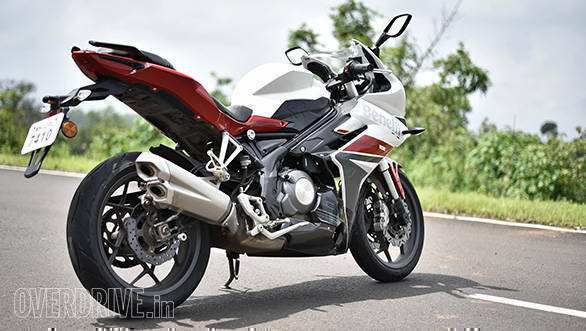 So, does the Tornado, excuse me, Benelli 302R have what it takes to woo what is proving to be a discerning buyer? 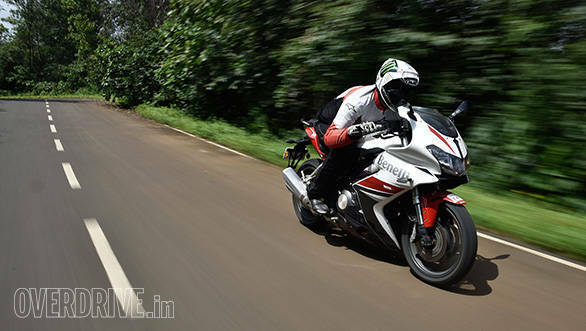 The Benelli 302R looks the part but its front-end is disproportionately larger than the rear, which makes it look odd. The fairing and headlights are a little too large I think. It gives the impression of a much larger motorcycle though, which is sure to appeal to a significant chunk of buyers. The fairing mounted mirrors are shaped like a leaf but the view offered isn't too good -- adjustment is limited. The instruments look pretty dated, and the quality of the plastic surrounding the clocks could have been better. The double-barrel exhaust looks nice with its brushed metal finish and complements the slim rear well. On the whole the 302R is a looker. In part thanks to its generous dimensions and then there is the bright white paint and red graphics. It certainly gets a lot of attention. Paint quality is good and switches work well but the quality of plastics used could have been slightly better. 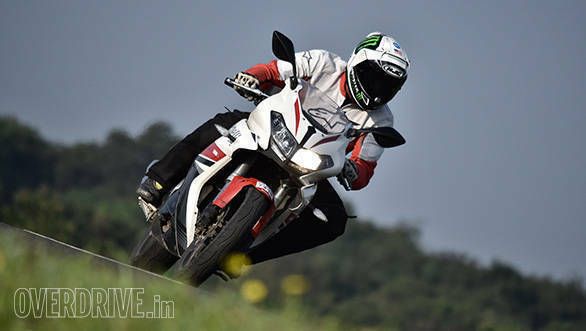 The DSK Benelli 302R uses the same liquid-cooled, fuel-injected 8-valve DOHC 300cc parallel-twin cylinder as the TNT300, with the same outputs - 38.5PS and 26Nm. The outputs are in line with what machines in the segment offer but the problem here is the 302R's 198kg kerb weight. The heft showed in our acceleration tests with the 302R clocking a 0-100kmph time of 8.7 seconds, which isn't quick when you consider the R3 achieved the feat in 5.5 seconds. Power delivery is very top-end oriented. The 38.5PS is produced at 11,500rpm while peak torque comes in at the redline. Okay wait. The issue is that the redline is marked at 10,000rpm and the engine actually revs happily past that. The limiter actually kicks in at 12,000rpm! You really do need to wring the throttle to extract the full potential - there isn't much shove at low revs. At times I was either waiting for the power to kick in or had to downshift. The engine isn't too quick to build revs either and the motor is fun only when you keep things on the boil. 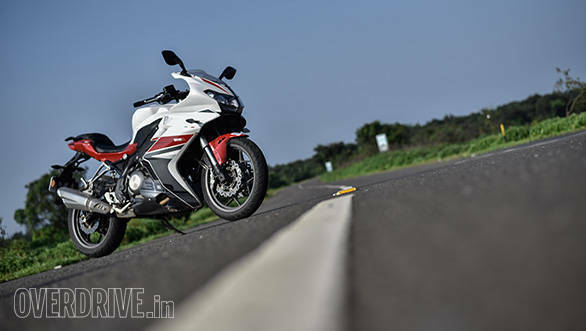 On the positive side, the engine's nature ensures the Benelli 302R will be friendly for everyone irrespective of how good or bad their riding skills are. It won't scare you even you're upgrading from a commuter. The engine is quite happy to sit smoothly at, say, 30kmph in sixth gear. It's just that there's no torque so you cannot do anything but cruise unless you downshift, ideally multiple times. 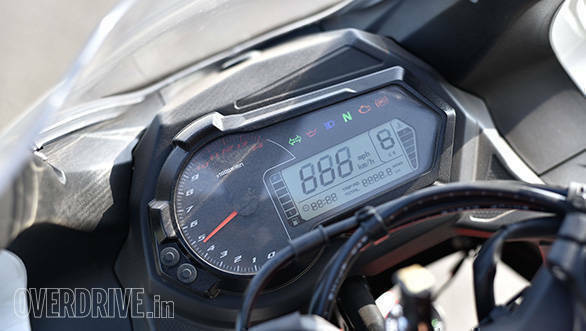 Fast movements require at least 7,000rpm or more to be showing on the rev counter. 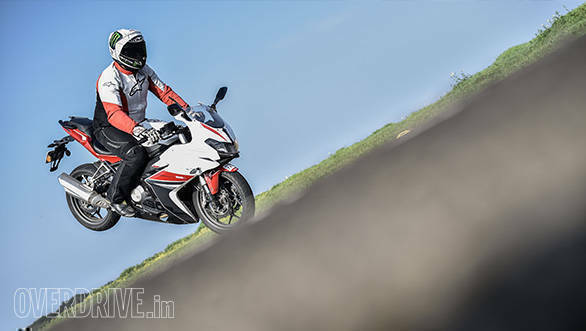 The Benelli 302R could make for a good touring machine given the relaxed demeanour. You can sit at 120kmph all day with the motor spinning at just above 6,000rpm. The engine also feels very refined but vibration creeps in through the footpegs as revs go up. The engine's highlight is the brilliant soundtrack. 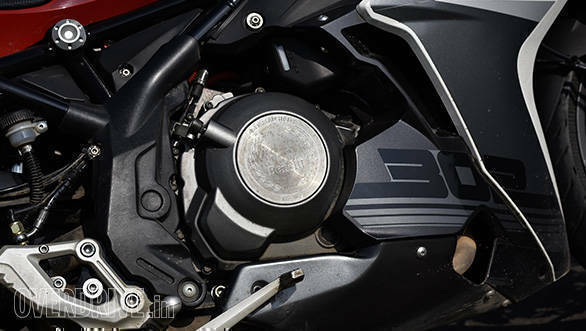 The intake howl coupled with the exhaust note make for a very nice sound unlike any other parallel-twin. The sound even reminded me of the aural delight that the Yamaha RD350 was. There is also the 6-speed transmission. The gearbox is extremely light, slick-shifting and calls for minimum effort. After a point, I stopped using the clutch for upshifts and was enjoying nailing clutchless upshifts perfectly, almost every time. 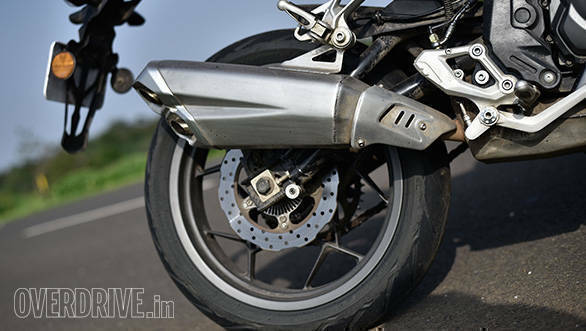 The 302R returned 32.2kmpl in city and 35.6kmpl on the highway which is impressive for a twin cylinder sportsbike. On the whole the 302R's motor is too top-endy for painless everday use and it should be more fun on a racetrack where you can keep the tacho needle pinned at 12,000rpm all the time. Although I have to admit that both the Kawasaki and the Yamaha will be a bit more than the Benelli there. That said, it is likeable given its refinement, the easy-going nature and brilliant soundtrack. The 302R is a bit of a mixed bag here too as ride and handling are good, but brakes lack bite. The chassis is different from the TNT300's and unlike the naked, the rear monoshock isn't offset. The front uses 41mm upside down forks which go well with the beefed up front-end in terms of looks. Front-end feel is good though I would have liked more feedback. The 302R comes shod with sticky Metzeler M5s - the same as the KTM 390 Duke - at both ends which work well in in making it an able handler. The bike isn't very quick to change direction given its weight and long 1,410mm wheelbase but feels stable and planted. On the racetrack, the 302R will feel good but its lap times won't be among the quickest. Ride quality is excellent as the Benelli made it through nearly every pothole it went through without a hitch. The suspension soaks up bumps and undulations well without unsettling itself or the rider. This, along with the relaxed seating  the clip-ons are not too low and the footpegs not too rear set  should make it good for commuting too. The pegs could have been higher though, as I was able to ground them rather easily around corners thanks to the Metzelers' confidence. I rode the bike from Mumbai to Pune without a single halt and at the end of it, neither were my wrists strained nor did my back hurt which speaks a lot about the comfort. Wind protection is good and the seat plush, which adds to its touring credentials. The 302R uses twin ABS-equipped 260mm front discs upfront. The setup is impressive on paper. It offers a progressive feel but lacks outright bite. Our brake test confirmed the same as the bike took a whopping 49.19 metres and 3.94 seconds to come to a halt from 100kmph. Braking from 80kmph was relatively better with the bike clocking 30.54 metres and 3.20 seconds. 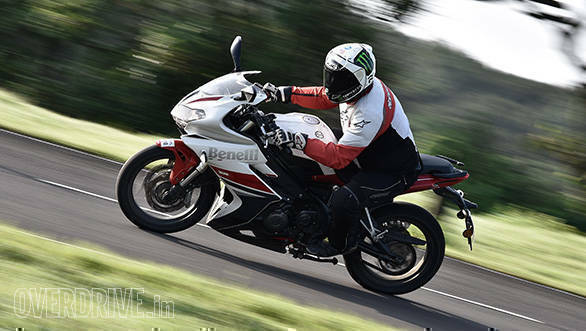 The Benelli 302R impressed me with its refined engine, slick gearbox, comfortable ergonomics and stable handling but it is lacking on a few crucial fronts. It's heft robs the bike of the sprightly feel the engine performance would offer otherwise. Then there's the fact that it handles well but feels lazy. The brakes are another problem, as getting to speeds isn't as big an issue as is slowing down from them. Some might like the fact that the 302R looks a lot bigger than a 300cc bike though there is no denying the oddness of the massive front end matched to the slim rear. So you might want to skip it if you are looking for manic performance, compact dimensions and razor sharp handling. But if relaxed manners, comfortable ergos and a big bike feel are your thing you should look at the Benelli. But the Benelli 302R will not make it easy for you. At Rs 4.21 lakh on-road Mumbai, the Benelli doesn't even have the usual value-for-money card to play this.